This topic describes troubleshooting steps for Workflow Manager 1.0 publishing, management and execution. Follow the steps in the Steps to Verify that Server Is Correctly Set Up. After you verified that the server is correctly set up, follow the steps in the Steps to Troubleshoot Workflow Management Service then retry your action related to publishing workflow activities. Follow the steps in the Steps to Verify that Server Is Correctly Set Up. After you verified that the server is correctly set up, follow the steps in the Steps to Troubleshoot Workflow Management Service and Troubleshooting the Service Bus for Windows Server then retry your action related to publishing workflows. Follow the steps in the Steps to Troubleshoot Workflow Management Service and then retry your action related to saving, updating or deleting workflow activities. Follow the steps in the Steps to Troubleshoot Workflow Management Service and Troubleshooting the Service Bus for Windows Server and then retry your action related to saving, updating or deleting workflows. Follow the steps in the Steps to Troubleshoot Workflow Execution section below. Follow the steps in the Workflow Configuration and Steps to Troubleshoot Workflow Execution sections below. Follow these steps to ensure that the server is set up properly. Verify that the steps in the Verifying the Service Bus Configuration and Verifying the Workflow Configuration guides were followed correctly. Open your web browser to the following URL: https://\[FQDN\]:1229, where [FQDN] is a fully qualified domain name of the server. If the browser displays a warning or error about certificates, the server is not set up correctly. Follow the Verifying the Service Bus Configuration and Verifying the Workflow Configuration guides to resolve the issue. The browser may prompt for credentials, but no error should be displayed after proper credentials are given. Follow these steps to ensure that the Workflow Management Service is configured correctly. Often, the most basic way to troubleshoot the Workflow Management Service is to recycle the application pool. Follow these steps to recycle the application pool. 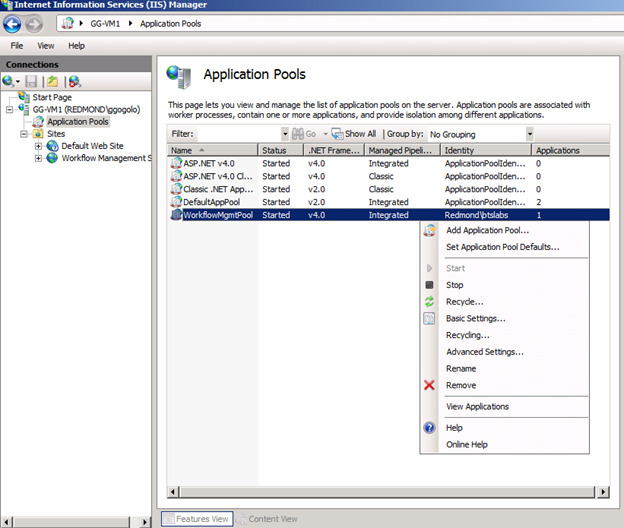 Under Application Pools, right-click WorkflowMgmtPool, and select Recycle… from the context menu. Verify certificate binding for the Workflow Management Site in IIS manager as described in the setup documentation. Follow the steps in the Analyzing Workflow Management Logs section below. Often, the most basic way to troubleshoot workflow execution is to restart the WorkflowServiceBackend service. Follow these steps to restart the service. Follow the steps in Analyzing Workflow Management Logs section below. Follow the steps in Steps to Troubleshoot Service Bus.